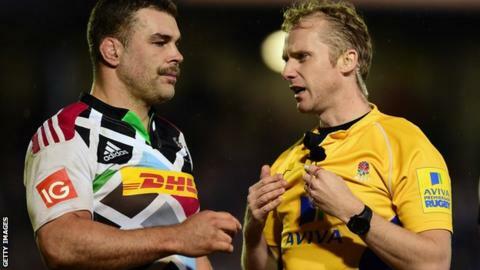 Relationships between rugby players and officials are "starting to go downhill", according to the Rugby Players' Association (RPA). England's referees' chief is to meet with the RPA next week in an attempt to address the issue. "We really want to improve relations with referees," said RPA chairman Christian Day. The Northampton second-row added: "To us it's starting to become an issue in the game." Rugby Football Union's head of professional game match officials, Tony Spreadbury, will attend an RPA board meeting on 26 January to discuss the matter. "It was always seen in the past that players have very good relationships with referees, and it was the real differing factor between football and rugby," said Day. "It's just starting to go downhill a little bit." Day, who also wants players to be consulted around some of the game's key issues, such as the scrum, has demanded a zero-tolerance policy towards diving, which has gradually crept into the sport over the past couple of seasons. His remarks come after the Toulouse wing Yoann Huget apologised for play-acting in the defeat by Bath in the European Champions Cup last weekend. "I think what we want to avoid is the football mentality of players shouting at referees and constantly questioning decisions, [as well as] play-acting which I think is coming into the game more and more over the last 12 months," he said. "With the game becoming more and more professional, players will always look for that little edge. "What we don't want in one of these big European games next weekend is a player to go down clutching his face, and a player to be sent off only for the replay to show he was play-acting. That's when rugby's reputation goes out the window."